I wanted to make sure I thanked my partner, so I began with a 4" square easel card and a matching box. 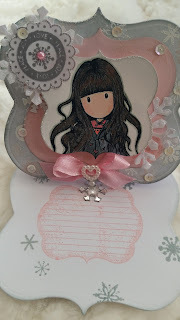 I layered my stamped image, pink and white papers using the Spellbinders Labels Nineteen (S4-311) set. The interior of the card is embellished with a glass snowflake, a pink label stamp from Santoro London, and grey snowflakes against the white background. I embossed the remaining snowflakes in pink and white inks on the exterior layer, adding sparkle with different embossing powders. 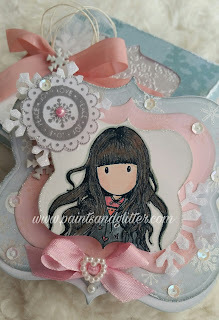 I also embossed the gorguss girl image, and added the stamped snowflake-layered with vellum snowflakes-made with a large Martha Stewart punch. 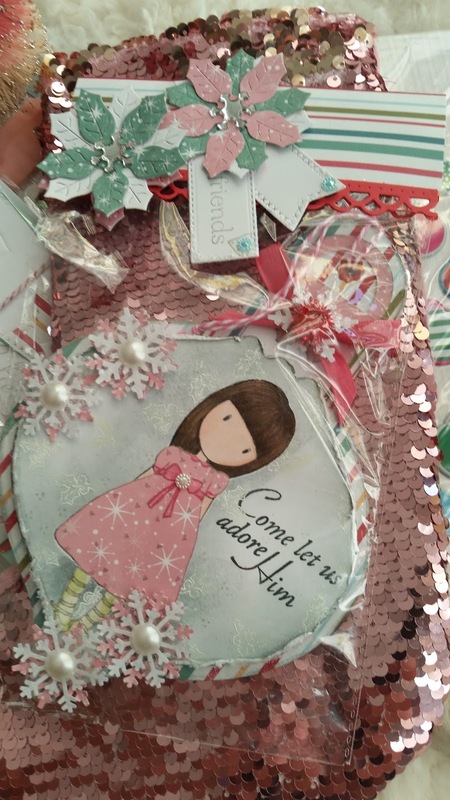 Little details included sequins, Distress Oxide Ink in Iced Spruce, a pearl heart, and pretty pink ribbon to finish it off. The edges got distress Stickles for a little sparkle. This beautiful and shabby Box was the perfect compliment to house my card, and I made it using my Cricut Explore Air 2, and a snowflake patterned paper that I distressed and layered. To complete the box, I layered a piece of glossy white vellum that I embossed with a Crafter's Companion Embossing Folder. I finished this with Vellum Snowflakes I made with a large Martha Stewart Punch, a gorgeous pink bow made with Seam binding, and some added tulle, twine, and a mini tag. Next was the Christmas Ornament, which I made layering papers and chipboard to make it sturdy. The base layer was a beautiful striped paper, and I decided to keep the top layer very feminine and pretty. 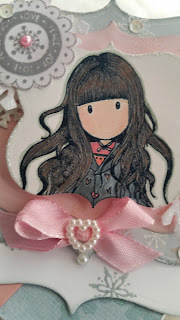 For this, I stamped, colored, and layered a Gorguss girl image. 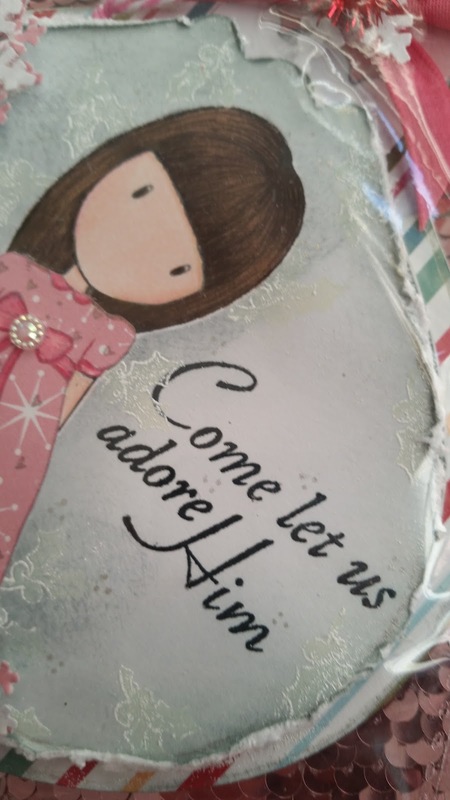 To make her stand out, I distressed the background using Ranger Distress Ink, and to add dainty details, I embossed tiny little holly and berry images in white embossing powder. 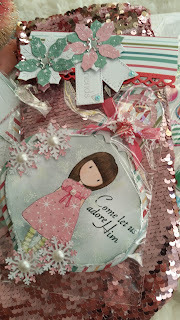 For a fun presentation, I also gave my partner the cards and some goodies in a gorgeous pink-sequined stocking. This beautiful sentiment came from a Recollections Stamp Collection called Christmas Noél. I also added more snowflakes, this time in pink and white, with a pearl center on each. 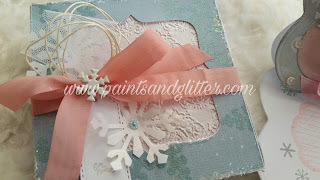 I used matching papers, and two Martha Stewart Snowflake punches, layered together, and glittered for sparkle. To see the rest of the goodies and details, please watch my video, and leave me a thumbs up if you like what you see!